I am back with another review…of a Rick Riordan book. I stumbled across this in a second hand book shop and just had to buy it. I knew it would be the perfect book to get out of my non-fiction mind into a fantasy state of mind so I can read some of them sitting on my TBR. As always, Rick Riordan knows how to write fantastic books. 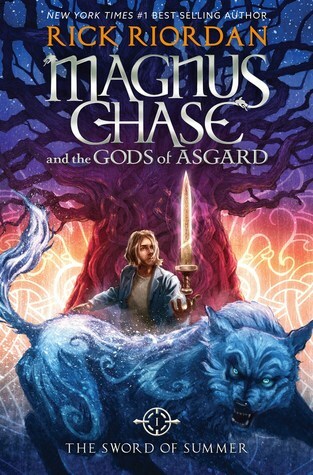 Magnus Chase and the Sword of Summer is the first in its series and gives you everything you love, enjoy and come to expect from a Riordan work. We follow our new protagonist Magnus Chase, rugged and hardened by living on the streets for two years after his mother dies in supernatural circumstances. In true Riordan style, he gets thrown into the world of the Gods and is tasked with stopping the end of the world. In this case it is the world of Norse Mythology and the cataclysmic event is none other than Ragnarok. After dying and being selected to live out his life in Valhalla, he is forced to go on the run to find the Sword of Summer and stop Surt from starting the chain of events that would lead to Ragnorok by cutting the rope that binds Fenris. He is also joined by his two friends from the streets, Blitz and Hearth, as well as his new companion Sam, an ex-valkyrie and complete badass. I loved everything about this book, and actually liked it more than some of the Percy Jackson or Jason Grace book (but please do not ask me to rank them!) I wish I had a copy of the next book in the series so I could read it now. –The diversity of characters- I always appreciate how diverse Rick Riordan’s books are, and this one is no different, and it never feels forced or out of place. We have Hearthstone, a deaf elf who communicates using sign language and is skilled in magic. We also get a small bit of his backstory and learn that he was looked down on by his family for his disability. We also Samirah al-Abbas (Sam) who is Muslim, a POC and wears a hijab as well as being a (ex) Valkyrie, daughter of Loki and overall such a well written and great character. –Reinterpretation of Norse Mythology– In these books there is always a unique spin on the traditional Gods and stories. I’ve read a couple other books featuring Norse myths (of course have watched the Thor movies from Marvel) and I always enjoy seeing the new ways authors take the character. As always the unifying of the worlds, in this case all nine of them, was done in an interesting way and I did like the choice of Boston as the main place of interest. –Pop culture references- Sometimes I feel like these references feel out of place but in this case they added some light hearted moments of comic relief. It is also a bit of a younger YA book, so again it felt like it had a place.